Bill Tancer of Hitwise recently presented some interesting stats on participation levels on Web 2.0 sites, his research found that only .16% of all YouTube visits were to upload video and only 0.2% of Flickr visits were to upload photographs. As we are in the “Participation Age” there seems to be a need to expand the number of participants. It’s questionable if brands are doing enough and by brands, we mean these Web 2 brands and creative brands in general; video cameras, computer brands, digital camera brands, printer brands, etc…. Obviously, the 1% rule is being played out, but think of the market potential if that 1% could be increased to 2%. Brands in this space need to think about how they can encourage participation, this is part incentive and partly education. The education part is important and can obviously there need to be different streams for different segments; from the non-user, to the user who isn’t interested in sharing. Clearly all brands that want to move into the Web 2 space and create community and conversation need to listen up, this stuff doesn’t just magically happen, it needs encouragement and education. 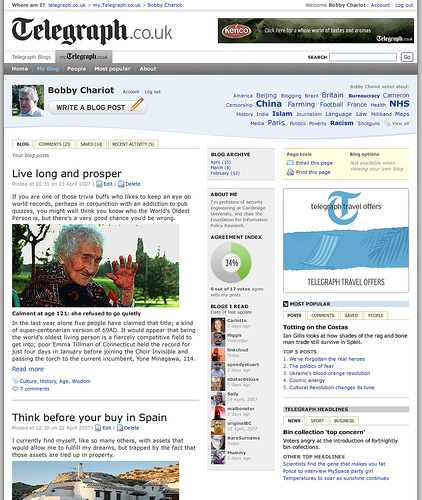 One interesting example is the Daily Telegraph newspaper in the UK, yesterday it launched a blogging service for its readers. For many, this could sound foolish, given the abundance of free blogging platforms, but this is smart as it’s going to attract their readers who trust DT more than the small blogging brands. In addition, in a challenging time for newspapers, there is a lot to gain by doing this and is reaching out and providing education and utility for a new group of participants. Participation is the tangible offshoot of engagement, which has become the fashionable thing to try and measure these days. It’s clear, if brands want thriving communities and strong brand relationships, they need do more than pay lip service to the notion of participation. Is participation a new metric for engagement?